Detail of Vogue 1471 by Yves Saint Laurent for Christian Dior, Vogue, January 1, 1960. Photo: Leombruno-Bodi. 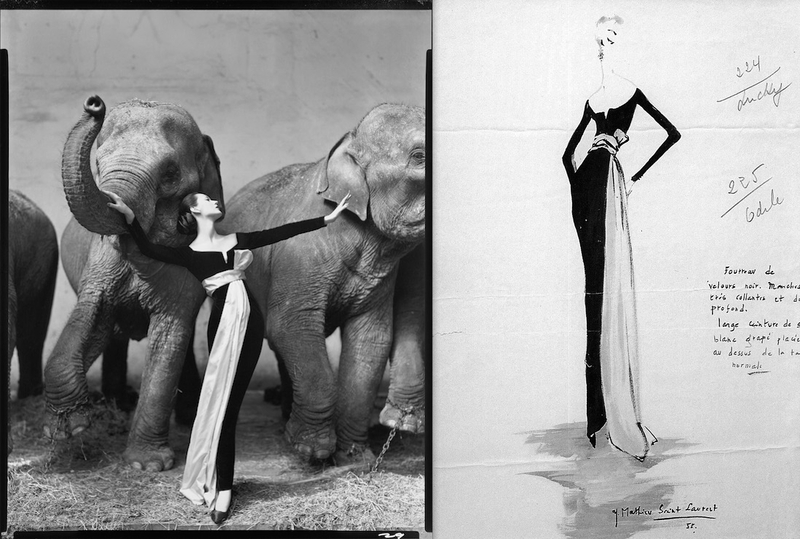 Richard Avedon, Dovima with Elephants, Evening Dress by Dior, Cirque d’Hiver, Paris, 1955, and sketch by Yves Saint Laurent. Christian Dior trapeze dress on the cover of L’Officiel, March 1958. Illustration: René Gruau. Image: jalougallery.com. The young Yves Saint Laurent designed six haute couture collections for Dior; Vogue’s licensing represents his last three collections for the house, from 1959 to 1960. Christian Dior label, automne-hiver 1959. Image: Metropolitan Museum of Art. Saint Laurent’s second Fall/Winter couture collection for Dior was controversial; L’Officiel declared its aesthetic “femininity pushed to the extreme.” Suits were shown with severely cropped jackets, and the skirt silhouettes included voluminous tiers and hobble skirts. 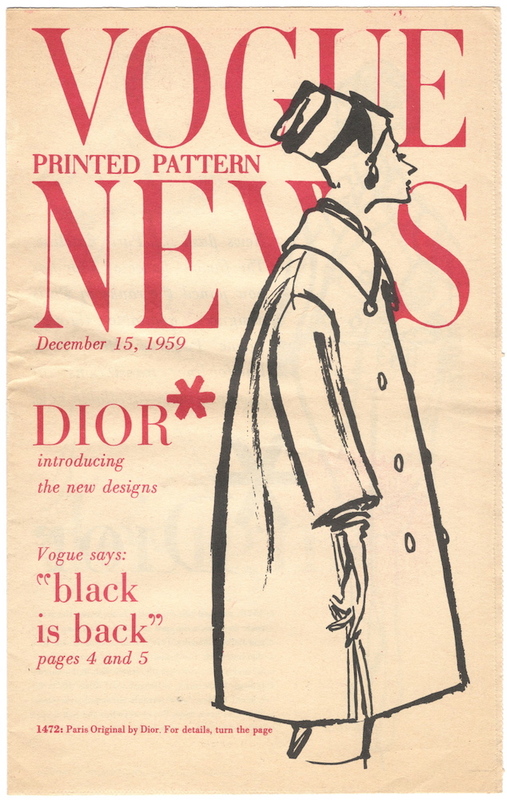 Vogue Printed Pattern News, December 15, 1959. Illustration: Esther Larson. 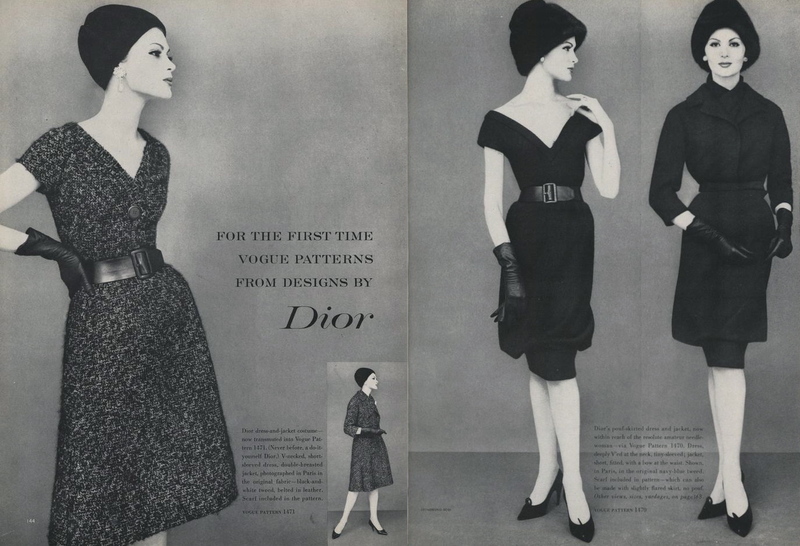 Dior patterns in Vogue Pattern Book, December 1959-January 1960. Illustrations: Esther Larson. Image: Make Mine Vogue. Vogue patterns from designs by Dior, Vogue, January 1, 1960. Photos: Leombruno-Bodi. 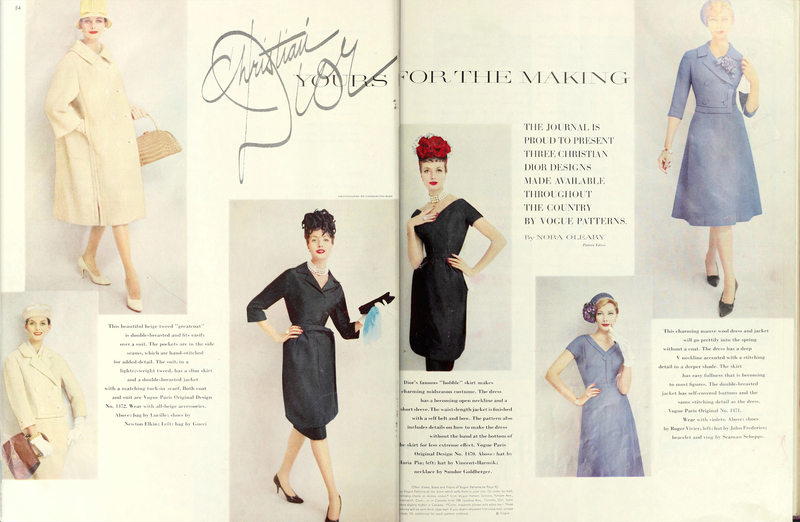 Nora O’Leary, “Christian Dior: Yours for the Making,” Ladies’ Home Journal, January 1960. Photos: Leombruno-Bodi. Image: Internet Archive. 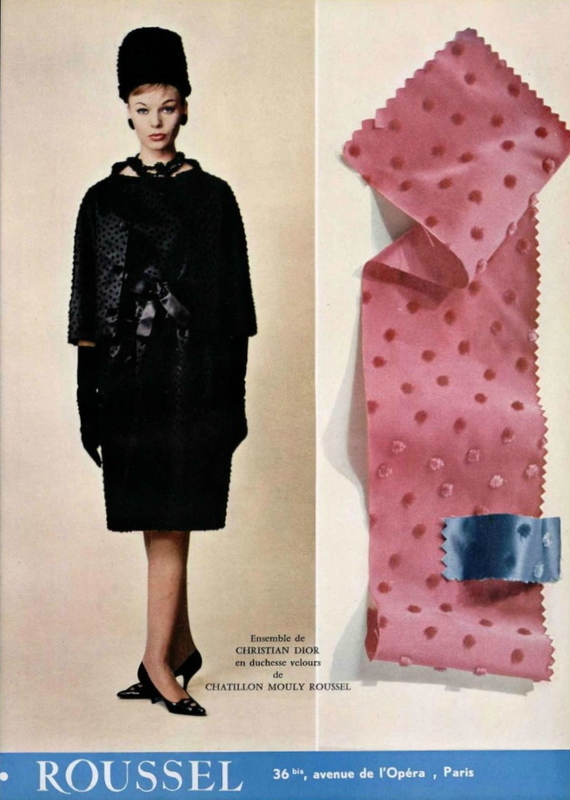 Vogue 1470 by Yves Saint Laurent for Christian Dior (1959) Dress and jacket. Here’s the envelope description: One piece dress and jacket. Skirt, with or without puffed tunic, joins the bodice at the waistline. Wide V neck-line with band finish. Short kimono sleeves. Short fitted jacket, joined to waistband, has concealed fastening below notched collar; below elbow length sleeves. Novelty belt. 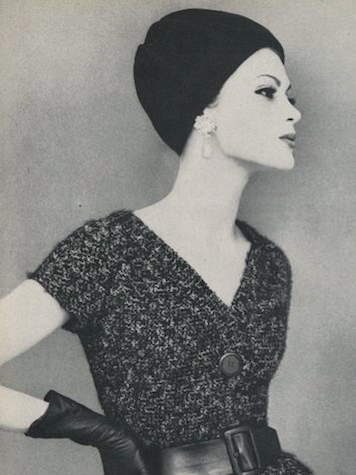 Vogue 1471 by Yves Saint Laurent for Christian Dior (1959) Image: Make Mine Vogue. The envelope description reads: One piece dress and jacket. Flared skirt joins the bodice at the waist-line. Single button closing below the wide V neck-line with extension band finish. Above elbow length and short sleeves. Double breasted jacket has notched collar and below elbow length sleeves. Novelty belt for version A.
Vogue 1472 by Yves Saint Laurent for Christian Dior (1959) Image: Vintage Pattern Wiki. Here’s the envelope description: Coat, suit and scarf. Double-breasted hip length jacket has a notched collar and below elbow length sleeves with buttoned vents. Slim skirt. Double-breasted, full coat in two lengths has a large shaped collar. Concealed pocket in side seams. Below elbow length sleeves joined to dropped shoulder armholes. Straight scarf. Vogue 1472 in Vogue Pattern Book, February/March 1960. Image: eBay. Saint Laurent’s Spring 1960 collection for Dior was characterized by rounded silhouettes and vibrant colour. L’Officiel noted its straight suits with jackets cut on the bias to achieve the suppleness of a knitted cardigan. 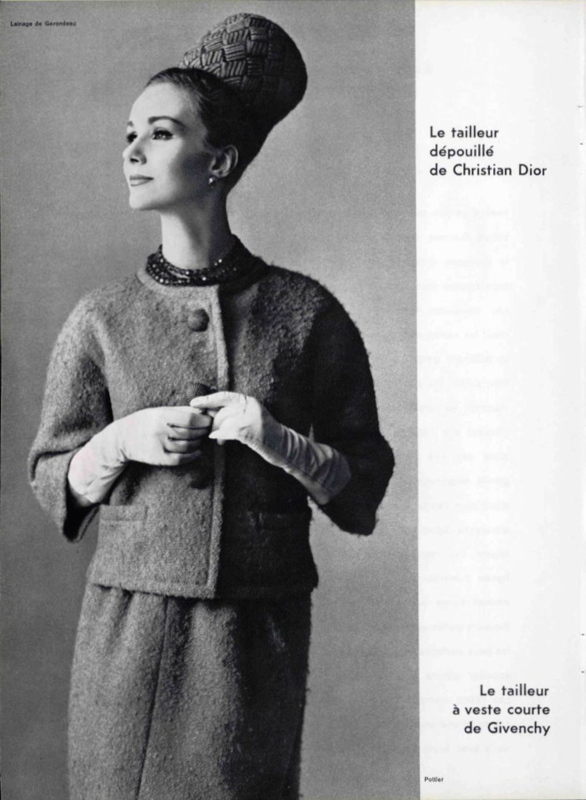 Vogue 1012 by Yves Saint Laurent for Christian Dior (1960) Image: Vintage Pattern Wiki. The envelope description reads: Suit and blouse. Short, straight jacket buttons below collarless away from normal neck-line. Welt pockets. Below elbow length kimono sleeves. Skirt has soft gathers from very shallow yoke. Easy fitting overblouse has shoulder straps crisscrossed at back. Christian Dior’s pared-down suit, L’Officiel, April 1960. Photo: Philippe Pottier. Image: jalougallery.com. 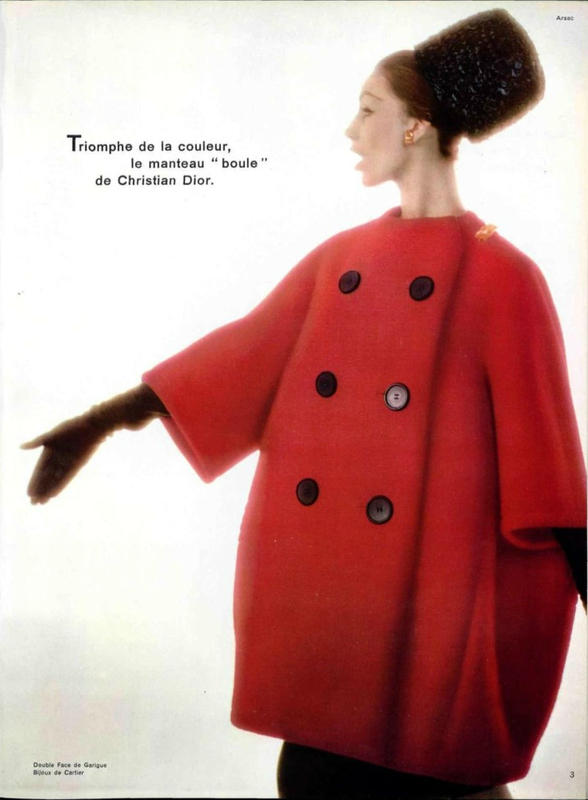 “Boule” coat by Christian Dior, L’Officiel, March 1960. Photo: Guy Arsac. Image: jalougallery.com. Silk dress by Christian Dior, L’Officiel, April 1960. Photo: Guy Arsac. Image via jalougallery.com. Yves Saint Laurent’s controversial final collection for Dior, le Beat look, was inspired by Left Bank icon Juliette Gréco and the Beatniks of Saint-Germain-des-Prés. It was innovative for its infusion of youthful, bohemian street style into the couture, with Beat elements including leather jackets, knitted turtlenecks, and plenty of black. Vogue 1041 by Christian Dior (1960) Image: Vintage Pattern Wiki. Here’s the envelope description: Suit and coat. Easy fitting jacket has high buttoned closing below neck-band. Vent opening in side front seams. Bracelet length and elbow length sleeves. Slightly gathered skirt has outside stitched front panel concealing pockets. Seven eighths length loose coat has opening in side seams. Away-from-neck-line standing neck-band. Bracelet length kimono sleeves. 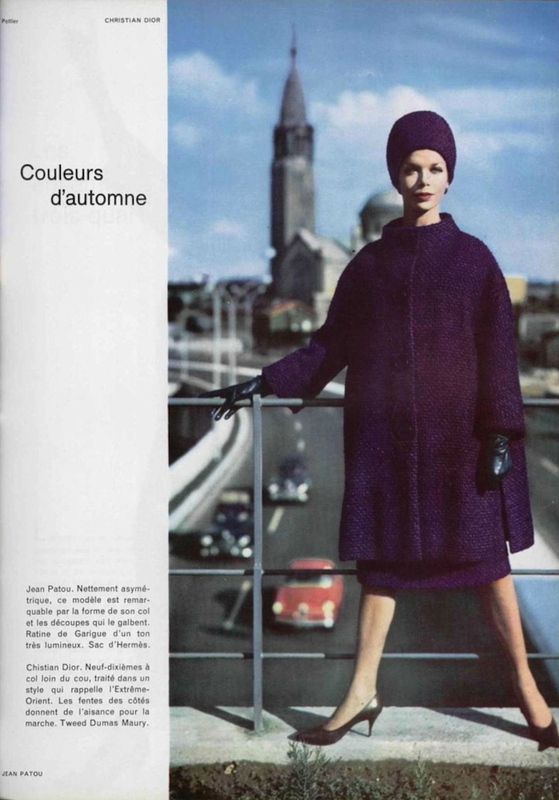 Vogue 1041 in Vogue, November 15, 1960. Photo: Henry Clarke. 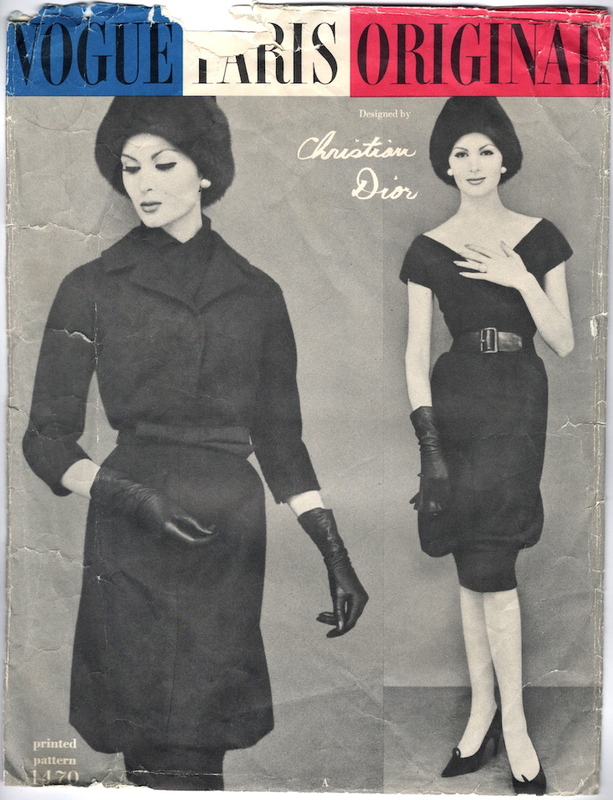 Vogue 1049 by Yves Saint Laurent for Christian Dior (1961) Image: Etsy. The envelope description reads: Suit and blouse. Box jacket has cut away fronts and simulated buttoned closing or complete buttoned closing, below standing band collar. Easy fitting overblouse with optional tied belt has bateau neck-line. Above elbow length sleeves and sleeveless. Slightly barrelled shaped skirt attached to bodice. 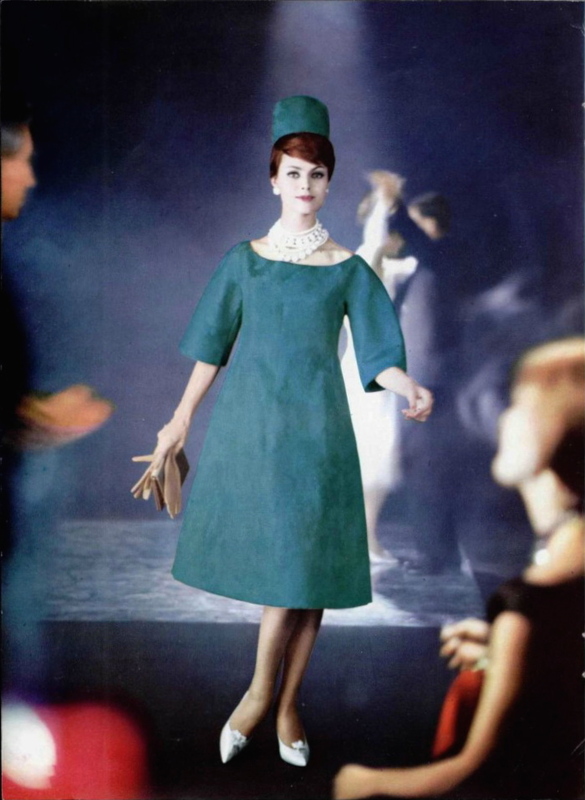 Chatillon Mouly Roussel ad showing an ensemble by Christian Dior, L’Officiel, October 1960. Image: jalougallery.com. 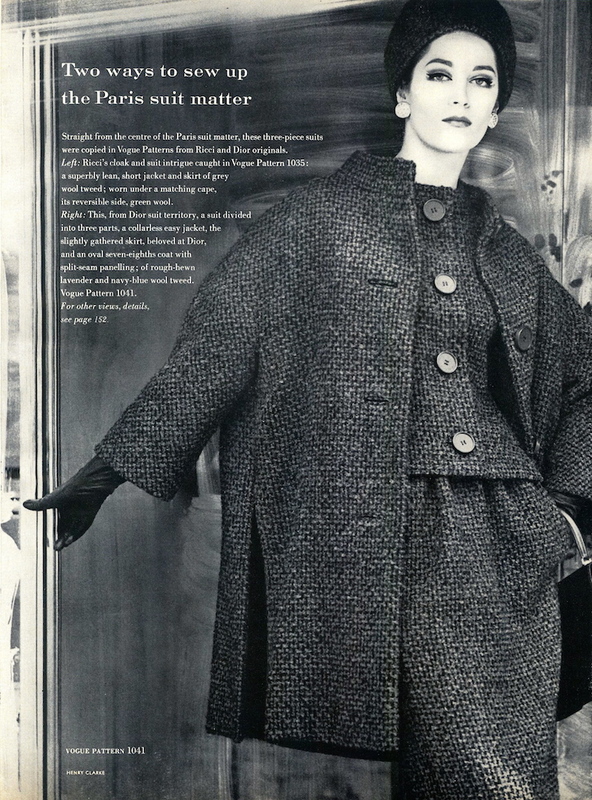 A Dior suit by Yves Saint Laurent, L’Officiel 1000 modèles no. 81 (2007). Image: jalougallery.com. Dorothea McGowan and Sara Thom in Dior, with Little Bara. Vogue, September 1960. Photo: William Klein. Image: Pleasurephoto. 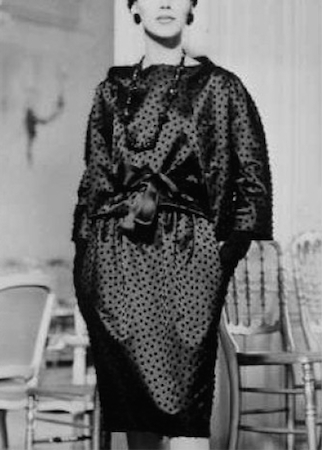 Dorothea McGowan in Christian Dior. Vogue, September 1960. Photo: William Klein. Image: The Fashion Spot. For more of Yves Saint Laurent’s work for Dior see L’Officiel 1000 modèles’ Dior special issue. Wow! So many beautiful designs! Thank you very much Sarah. You’ve made me very happy. My pleasure, Paco. I’m so glad you like it. I hope to make V1470 soon. Fabulous post! It’s good to be reminded of Saint Laurent’s constant real influence on the clothes ordinary people bought and wore. My biggest disappointment with the retrospective in San Francisco was that it missed the opportunity to show how quickly his designs were translated into fashions available in stores and worn by women at all economic levels. My first real suit, in 1961, was definitely inspired by these designs, but probably not made from a Vogue pattern. Suits like 1049 and 1041 were still being worn in the mid 1960s. A most interesting post, and a genuine addition to fashion and pattern history. I love these designs – mainly wearable (apart from the hobble), very elegant, and beautiful, appropriate fabrics. How exiting that you will be making up Vogue 1470. Thank you Sarah for continuing to stimulate, educate and excite.